If you are interested in learning about micro controllers and building your own projects then I would recommend the MiniPOV kit from Adafruit Industries. This is a kit and will need to be assembled so if you do not have a soldering iron you will need to borrow one. From this you will learn to build kits and solder, program a AVR micro-controller, and control some LED‘s. This entry was posted in Gadgets, Open Source on 21/11/2011 by Paul. I don’t own and XBOX360 but a friend had an issue with 3 red lights flashing on the front of the unit. After a small time searching the web it appears that this is a huge problem with XBOX360’s. This fix involves replacing spring clamps for the heat sinks with screws and then overheating the unit. I was pretty skeptical but there was a lot of references on the web. 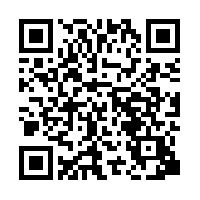 This entry was posted in Automotive, Gadgets, Phones on 07/08/2011 by Paul. I have been pretty busy lately with some other projects which I will post later but I did find this very simple project for the Arduino on the Adafruit website. It uses a photoresistor and a piezo buzzer and a very short piece of code. It is easy to build and easy to modify. If you are new to electronics it is a great way to see these components in action. This entry was posted in Arduino, Gadgets on 21/05/2011 by Paul. Gaurav Manek has put together a great project mixing several technologies. He has a radio controlled car interfaced with an Arduino and this can be controlled from an iPad or using a Kinect. He has given some details on how he achieved this including some source code for anybody that wants to have a go. Go to http://www.gauravmanek.com/blog/?p=33 to see it in action. The first half of the clip is for the iPad the second is for the Kinect. This entry was posted in Arduino, Gadgets, Hacking, Kinect and tagged arduino, IPad, kinect, Radio-controlled car, Remote control, Ruairi Glynn, Source code, The Bartlett on 06/04/2011 by Paul. This entry was posted in Arduino, Gadgets, Hacking and tagged arduino, Light-emitting diode, Seven-segment display on 01/04/2011 by Paul. The Arduino is truly a fabulous piece of kit if you are new to the world of micro controllers. There are hundreds of examples of hardware projects on the web along with the source code that drives them. 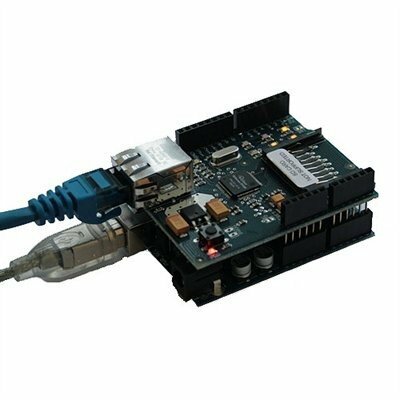 My latest project involved the use of an ethernet shield which allows the Arduino communicate with your LAN and therefore the internet. I can now control my flashing LED‘s remotely (actually my test involved being over 15 miles away) using a web browser. Still early days I know but a quick search on Google will give you some ideas of the possibilities. Next step I think is to add a sensor and read some values. A simple circuit should be able to read temperature or a PIR detector from an alarm system would allow me to remotely check if somebody is in a room. 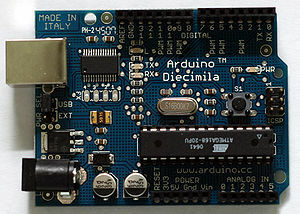 This entry was posted in Arduino, Gadgets on 28/02/2011 by Paul.